Our February meet was a success! Gage opened up his home for us again. The meet was one of the better attended meets we’ve had in some time, not to mention the food spread. Gage has a lot going on in his garage! 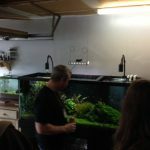 He gave us a tour of all his tanks, big and small, and systems (breeding setup). We were able to revisit “Big Burma,” the Monster Tank that the club helped set up at Gage’s first Open House back in March 2016! You can see the progress in his Journal. 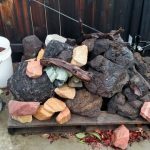 In addition, Gage offered up some of the hardscape materials he bought to those who were interested. As for the swap, well… there were plenty of plants to go around. I can’t remember the last time a plant swap ran for about an hour! All in all, a great meet. Looking forward to the next one!